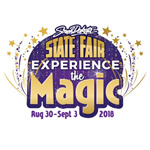 Huron, SD - With the help of day sponsors, the State Fair is able to offer special days at the 2018 South Dakota State Fair. Wednesday, Aug. 29, is Channel Seeds Preview Day. Preview Day at the State Fair offers free gate admission to allow fairgoers a sneak peak of the fair. The carnival will open at 5 p.m. and all rides will be $1 each. The Red Wilk Construction Tuff Hedeman Bull Bash kicks off the grandstand entertainment at 8 p.m.
Thursday, Aug. 30, is Value Added Ag Day where attendees can experience the magic of value added agriculture in South Dakota. All day long at the Day Sponsor tent, different food, farmaceutical, fuel and feed products from across the state will be featured, courtesy of the SD Specialty Producers Association. There will be cooking demos of local food inspired creations and tasting opportunities. Also on Thursday, the South Dakota Dairy Producers will host the 19th annual Ice Cream Social. Friday, Aug. 31, is Prostrollo Motors Day. Make sure to stop by Prostrollo Motors on east Highway 14 in Huron prior to the fair to pick up a coupon for $1 off gate admission at the State Fair. Stop by the Prostrollo Motors Building to see the newest vehicles from Chevrolet, Buick, GMC and Cadillac, including a great selection of 2018 Chevy and GMC pickups with huge model yearend discounts. Also, sign up for a chance to win the “Best Seats in the House” at the Friday, Saturday and Sunday shows in the Grandstand. Saturday, Sept. 1, is SD Farmers Union Day. SD Farmers Union will host events throughout the day celebrating the family farmers, ranchers and rural communities from across the state of South Dakota that they so proudly represent. Highlighting the day of activities will be the annual Farmer’s Share Luncheon (limited number of meals available) located in the tent near the Freedom stage from 11:30 a.m. to 12:30 p.m. In comparison to the retail price of the meal, $10, attendees will pay just $0.30 for a meal that showcases the farmer’s share on retail food dollars. The Farmers Union will also host a panel featuring South Dakota State Farm Service executive director Paul Shubeck and South Dakota Farmers Union president Doug Sombke, who will discuss and welcome feedback on the new upcoming Farm Bill. Sunday, Sept. 2, is DPS Share the Road Day, when officials with the South Dakota Department of Public Safety will be present in the Day Sponsor Tent to highlight all the ways the department works to keep the public safe. The department’s theme this year is motorcycle safety. DPS will be reminding individuals to slow down, watch for others, wear the proper safety equipment and be ready to “share the road” with others. Also in the tent will be educational programs, games, the chance to renew driver’s licenses (two address documents required) and Highway Patrol police dogs. Monday, Sept. 3, is Fairytales and Fantasy Day when kids can dress up as their favorite fantasy character and will be eligible for $1 off admission in to the fair. Also on Monday, the Diaper Derby and Mane Attraction are all part of the entertainment put on at the NorthWestern Energy Freedom Stage. The State Fair will be ‘Paying the Magic Forward’ on Monday thanks to businesses that have banded together to sponsor gate admission passes. Fair officials will randomly hand out free passes at the gate admission entrances. Participants can also ‘Pay it Forward’ to the food pantry by bringing a non-perishable food item for the “Drive to End Hunger” between the hours of 7 and 11 a.m. and receive $2 off gate admission. The 2018 South Dakota State Fair will run from Thursday, Aug. 30, through Monday, Sept. 3. Channel Seeds preview night will be Wednesday, Aug. 29. 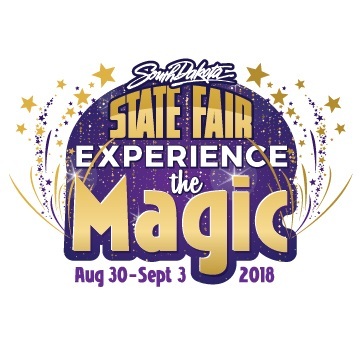 This year’s theme is “Experience the Magic.” For more information on State Fair events, contact the Fair office at 800.529.0900, visit www.sdstatefair.com or find them on Facebook or Twitter.